Captivate your audience like never before with stunning holograms. Holograms are a unique option to enhance a setting by presenting a visually-engaging work of art that can deliver a message, unlike any other medium. 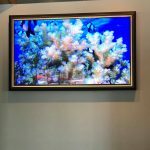 Innovative Displays for Showcasing Digital Signage: Nothing conveys your signage better than a 3D hologram that presents the perfect balance of a beautifully-crafted artistic display with interactive technology. Stunning Design: Not just made to look beautiful, our holograms are crafted for the highest level of durability, longevity, and captivating appeal. They are made to bring to life your visions for communication in the most captivating manner through the experience. Easy Setup: Our holograms are made for ease of use, which allows you to use them in a multitude of applications without a hassle or a complicated process. Key Protected Door: For security and safety, a key-protected door was developed to ensure your investment remains protected at all times. Effortlessly Change the Content: Freedom, access, and flexibility are tenets we see as necessary when it comes to digital signage, and our holograms allow for very simple changes in content, if needed. Customization is key! 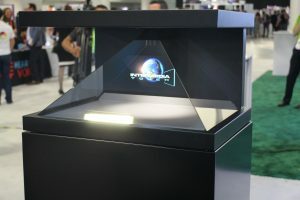 High Reliability: When it comes to a presentation, you need your technology to be as reliable as possible, and our holograms are designed for ease of use and convenience in every circumstance. Few methods of communication can grab the attention of customers and people passing by better than holograms. Bringing an artistic approach that features very lifelike visuals, holograms are becoming one of the most desired means of interactive technology. Any environment or setting can be enriched through the use of a hologram, as they are custom tailored to your exact needs, based on the presentation you are aiming to provide. Holograms deliver a unique 3D experience, offering captivating imagery that can be viewed at every angle. 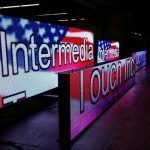 If you are seeking the most advanced, experienced company to create the right products for your signage needs, look no further than Intermedia Touch. We can create the ultimate hologram for your display. Contact us today and let us bring your visions to life!